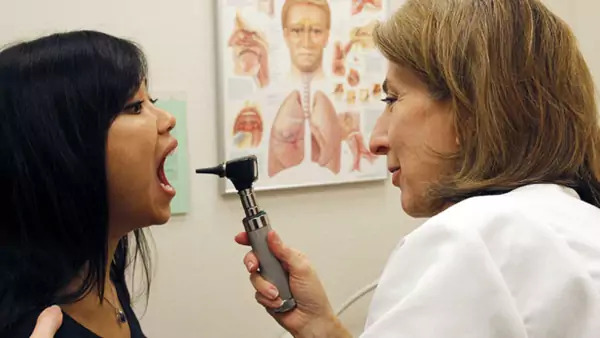 Dr. Liz Sequeira examines a patient at the Discovery Wellness Center in Silver Spring, Maryland (Jim Bourg/Courtesy Reuters). As part of CFR’s Renewing America initiative, we spend a lot of time looking at how well the United States is doing against other countries in areas such as education, investment, research and development, and the other foundations of a strong economy. Usually the answers we find are mixed – the United States is pretty strong on innovation and higher education, pretty weak on infrastructure and primary education, etc. Most of the answers are not terribly surprising. But a new report out yesterday from the National Research Council and the Institute of Medicine stunned me: on the one measure that counts the most – longer and healthier lives for Americans – the United States is failing abysmally. Americans are living shorter, unhealthier lives than citizens of any other advanced country in the world. Among seventeen high-income countries, the United States ranks last in life expectancy for males and second-last for females. The United States has been falling in this ranking for the past three decades, especially among females. The United States has the highest infant mortality rate of any of these countries. U.S. adolescents and young adults die more frequently from traffic accidents and homicides, and have the highest rate of sexually transmitted diseases, including AIDS. Since 1980, the chances that a newborn will live to age fifty have been consistently lowest or second-lowest among the seventeen countries. And the United States has been getting steadily worse over time. The chart below from the report is slightly confusing, but it captures this deterioration. What it measures is the likelihood that a girl who reaches age fifteen will live to age fifty. From 1958 to the early 1970s, the odds of an American girl dying before age fifty was about the same as that of a Japanese girl or a British girl. Since then, the United States has fallen further and further behind. Today, the odds of the American 15-year-old girl dying before age fifty is about 4 percent, compared with a 2 percent average likelihood in the other sixteen countries. What the numbers in the chart suggest is that the United States is about forty years behind where it ought to be in improving the health of its young women. pervasive over the life course—at birth, during childhood and adolescence. There are a few positives if you look hard enough. Americans drink and smoke less than those in most other advanced countries. Fewer of us die from cancer. And those who manage to make it to age seventy-five actually live longer than their peers in other countries. There is no single reason why Americans are so unhealthy. The report cites multiple causes that range from more reckless individual behavior to social ills. On the individual side, Americans consume more calories, have higher rates of drug abuse, are less likely to wear seat belts and more likely to drive drunk, and are more likely to use guns against each other. The societal causes include inaccessible or unaffordable health care, cities and suburbs that discourage people from walking, higher levels of poverty (especially child poverty) and income inequality, a lack of social mobility, and a weaker social safety net. The report notes, however, that even the most privileged Americans – white, upper income, college-educated, with health insurance – are in poorer health than their peers in other wealthy countries. The report has many recommendations, but its primary goal is to raise awareness about just how bad the health of Americans has become. It notes: “Americans may know about some deficiencies in the U.S. health care system, but most might be surprised to learn that they and their children are, on average, in worse health than people in other high-income countries.” I was one of those.